Officially known as the Academy Award of Merit - and nicknamed the Oscar - this 13 1/2 inch statuette is the world's most recognized trophy according to the Academy of Motion Picture Arts and Sciences, the organization who has bestowed 3,048 of them since 1929. IU Libraries' Lilly Library is now home to four of the historical awards thanks to Dan Ford of Encino, California, biographer and grandson of legendary motion picture director John Ford (1895-1973). 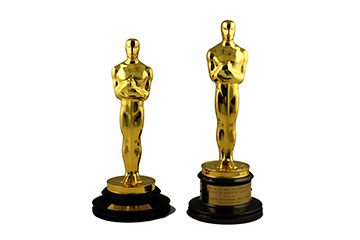 The two most recently donated statuettes, Best Documentary for December 7th (1943), and Best Director for The Informer (1935), join his previous gifts - Oscars John Ford received for The Grapes of Wrath (Best Director, 1940) and How Green Was My Valley (Best Director, 1941). The Lilly Library is committed to both preservation and access, says Ford. This latest gift reconnects John Ford's Oscars with the work they recognize. Ford says, "I believe it's best to keep everything together. I want to do that in a place where my grandfather's work will be respected and also available to his many fans, as well as scholars and academics." Materials relating to films in the Lilly Library range from a collection of 1,000 stills for the 1925 silent version of Ben Hur, to theatre lobby cards, press books, and publicity stills, to a second draft script for the 1981 Academy Award winner, Chariots of Fire. The 1982 acquisition of John Ford's personal archive included correspondence, papers and memorabilia. This collection represents the Library's interest in acquiring materials to provide in-depth film research opportunities. An online overview of these collections demonstrates the success of the library's many decades of preserving materials in the areas of film, television and radio. As part of his important work to write John Ford's biography titled, Pappy: The Life of John Ford (1979), Ford indexed much of the collection. This work, including taped interviews with family and friends, is a remarkable piece of the Lilly Library John Ford collection. John Ford fans will appreciate the 2,500 items in the correspondence files (1906-1976), concerning his personal and professional life. In addition, the collection holds 3,500 photographs and movie stills, copies of his films, and John Ford's personal home movies (some featuring friend John Wayne). And, now four of his six Oscars. Erika Dowell is the Associate Director and Curator of Modern Books and Manuscripts for Lilly Library. She notes the historical prominence of this latest gift, saying, "We now possess three of John Ford's four Academy Awards for Best Director. In his prolific career he directed over 130 films and still holds the record for the most Best Director Academy Awards." Oscars.org, the official site of the Academy Awards, reports that the 2017 ceremony will be held on Sunday, February 26. Nominees were announced Jan. 24. According to Oscars.org, "Oscar stands 13½ inches tall and weighs in at a robust 8½ pounds. The film reel features five spokes, signifying the five original branches of the Academy: actors, directors, producers, technicians and writers. Although the statuette remains true to its original design, the size of the base varied until 1945, when the current standard was adopted." This interesting fact may account for the reason why one of the four Oscars in the collection stands on a base taller than the others. It was presented to John Ford in 1943. Many of the world’s literary treasures are protected in museums and libraries open only to scholars and curators. At Indiana University our legacy includes a commitment to culture for everyone. All are welcome at the Lilly Library and there is never a fee for admission. Learn more about viewing the John Ford collection and make an online research request on the Lilly Library website.